A young gas station employee in Nova Scotia is giving everyone a lesson on exceptional customer service after obliging an elderly woman who wanted to dance in the store. Sean Fraser, 22, was working at his father’s gas station, Milne Court Petro-Canada, on Sunday evening in New Minas, N.S. when he served an elderly customer and her husband as they shopped in the store. “I took her purse and she took the lead, and it was kind of history from there,” Fraser told CTV News Channel on Thursday afternoon. Security footage captured the sweet encounter of the young man with the woman, who he said broke into song as her elderly husband looked on with a smile. “It was really charming,” said Fraser’s father Scott, who watched the security footage of the dance. In an interview with CTVNews.ca, Fraser said he was at first taken aback by the dance request. Fraser’s father later posted the security footage of his son’s dance on the gas station’s Facebook page, only to see it rack up thousands of likes and views online. “We do things out of the ordinary every day, however, this was extraordinary,” Scott Fraser said, adding he wasn’t expecting to see the footage go viral. Scott said he’s proud of his son, who is on summer break from Queen’s University in Ontario, where he is studying commerce. “Sean has always been a young man that has shown empathy and caring and that just reinforced it,” Scott said, adding his son was willing to do “whatever it took to make the lady happy. All the attention over the Facebook post has been “unexpected” and “humbling,” but exciting at the same time, said Fraser. “One minute you’re at work and the next minute you’re on TV. It’s been interesting to say the least,” Fraser said. Fraser says his dancing partner’s husband is a regular customer but it was the first time he’d met his wife. After they danced, the woman was so happy, she was “dancing out of the store,” and forgot her purse. Now, the family is trying to track her down to return it. “Hopefully she comes in again, I’d love to see her, tell her all about what’s happening,” Fraser said. N.S. 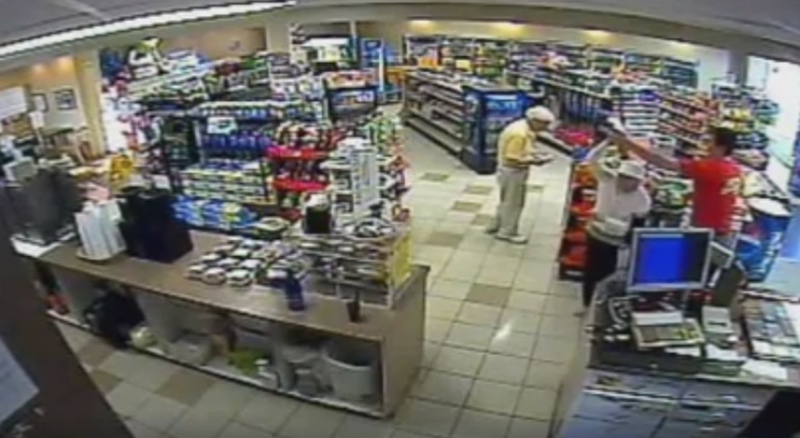 gas station employee Sean Fraser is seen on security camera footage dancing with an elderly customer.